Short-barrel lock for use on backboxes on many later-model Bally & Williams games and some later-model Stern Pinball games with lock over top/center of backglass/translite. Chrome finish. 5/8-inch length barrel (threaded portion of lock). 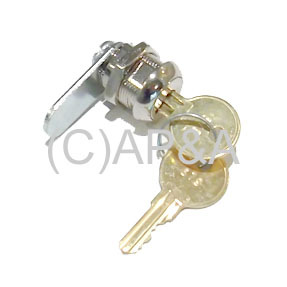 Single-bitted (uses 1-sided key- included). Replaces Stern # 355-5018-02 and others. Bally/Williams Installation Note: Tab that comes with this lock is slightly longer than original tab used in these games. Retain and re-use original short tab if possible, or new longer tab can be cut short to fit properly. Easy to install- requires only a wrench and Phillips screwdriver. Avoid damage and injury by keeping your game locked and safe!